RV rooftop air conditioners pack an amazing amount of cooling power into a unit that is lightweight, will run off 120 volt a.c.power, and will survive the rigors and vibrations of over the road travel. No matter which brand you have- Coleman, DuoTherm, Carrier AirV, Emerson Quiet Cool, or another- they all work on the same principal. To understand what can go wrong- let's first look at how they work, with some basic theory. Like a refrigerator, an air conditioner operates not really by cooling the air, but rather by removing the heat from it, and dumping the heat outside. While this may seem like "nit picking", it is a very important concept in the operation of the unit, and vital to understanding how it works. The basic parts of an air conditioner are the sealed system- consisting of a compressor, a condenser, an evaporator, and the tubing used to tie it all together, the air moving system, consisting of a motor (only one in a typical roof top unit), and two fan assemblies- one to move air across the condenser, the other to move air across the evaporator. The sealed system contains the refrigerant, which in this case is R-22. We will start the heat removal process at the compressor- which, as the name suggests, compresses the refrigerant (which at this point is a vapor), at the same time adding heat to it. 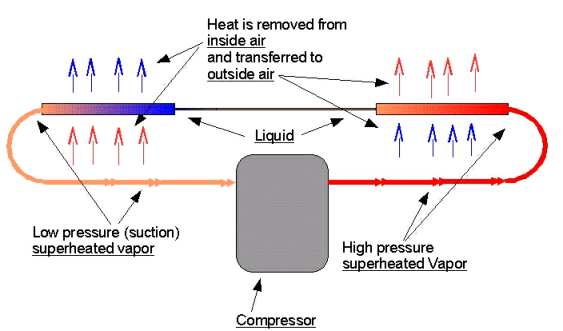 This "superheated" vapor then travels to the condenser (the "outside coils"), at which point the heat that was added by the compressor is removed (by the air flow from the condenser fan), cooling the vapor and causing it to condense to a liquid. From here the liquid travels through a capillary tube, which regulates and restricts the amount that can flow through it, into the evaporator (the "inside coils"). The liquid refrigerant is then able to expand, but in order for it to expand, it has to absorb heat from the air being passed across it by the evaporator fan. As the refrigerant reaches the end of the evaporator, it has absorbed enough heat to vaporize it, and it turns into a superheated vapor. From here the suction side of the compressor pulls this superheated vapor in, compresses it, and the cycle starts over again. From this explanation we can see that there are only a few requirements for a properly operating air conditioner. A properly designed system (which is a given), A properly charged system (we'll get to that in a bit), and adequate airflow over the condenser and evaporator, so that the evaporator can absorb enough heat, and the condenser can "dump" the heat outside. A major part of the refrigeration process is the fact that it takes far more energy (heat) to change a substance from one state to the other- by state, I am talking about solid, liquid, or gas. When talking about air conditioners, we measure energy in the form of btu's. A BTU is the energy required to raise the temperature of one pound of water one degree farenheit- so to change one pound of 32° water to 33° water requires 1 btu, but.. to change one pound of 32° ice to one pound of 32° water requires 144 btu's. The same principal holds true with the refrigerant in air conditioners- the heat is absorbed in the process of changing the refrigerant from a liquid to a gas. If the unit is not properly charged, the change will take place too quickly, or not at all. But... the reason that I point this out is not to have people run out and have their service man "Check the Freon ®"- for two reasons- One- the system is sealed with the proper charge from the factory, and the proper charge is usually around 13 ounces of r-22. With this small amount of refrigerant, if there is a leak in the system, odds are that it will be empty, and not just "low". The other reason is that it takes a lot of care and a scale to weigh the refrigerant to properly charge one of these units. I'm not saying that it cannot be done with simple gauges, but the likelihood of getting a proper charge is very low- and 95% of the time, the refrigerant charge is fine. All right all ready- how do I fix it..